One of the things I remember best about my mum is that she used to be shocked and appalled by anything she thought was ‘rude, lewd or crude’, to use her exact and frequently repeated words. Growing up, this boiled down into the complete and total ban on all kinds of swearing, and also, strangely, everything on ITV, which she considered to epitomise the concept of ‘rude, lewd and crude’ perfectly. That’s another story, though. Ordinarily, this blanket ban on all profanity would have firmly included foul-mouthed uber-chef Gordon Ramsay, but somehow it didn’t. Mum loved Ramsay’s Kitchen Nightmares and she watched The F-Word every week, despite all the effing and jeffing. I never asked her about this, but I think I understand. When some people swear, it’s vile and offensive, but when other people do it, it’s not so bad. They carry it off. It’s part of their personality and appeal. It’s a complete and unexplainable set of double standards. We all loved our mum for this, and the rest of her very funny little idiosyncrasies. I’ve been watching this series of The F-Word with huge interest, sparked by the first episode where local Italian heroes Salvo’s demolished their opponents to be named Britain’s best independent Italian restaurant. There’s a proud banner over the door now, and no chance of a reservation until about 2015. There’s been some superb cooking on show, and I find watching small time chefs rising to a big challenge captivating. My brother, The Chef, managed to score a place at the eventual final, which is on at some time during Christmas week. I can assure the production company that their non-disclosure agreement is still very much intact – he won’t tell me who’s won, despite all my attempts to bully, trick or otherwise extract it from him. As with all things Ramsay, the latest series of The F-Word comes with a book, a great big cash-cow of a book, released conveniently in time for the Christmas rush. No, really, I’m not cynical. Cynicism comes easily when Ramsay is involved. There’s been lots of muttering about him recently. Overexposed. Lost his edge. A parody of himself. It’s easy to see where these views come from. My shelves are heaving under the weight of Gordon Ramsay’s books, and it seems sometimes that he’s never off the telly, but I’m not so sure that’s the whole story, or even the part of the story that really matters. 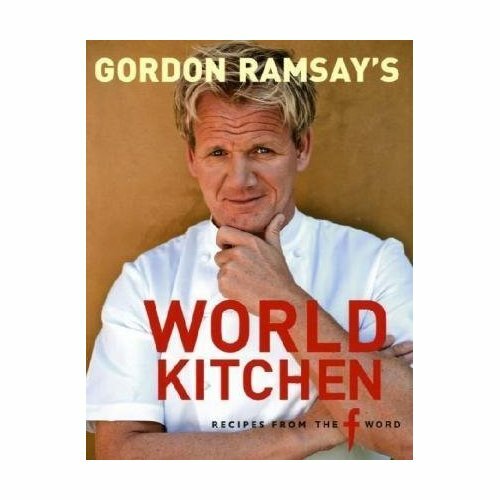 Take World Kitchen, the book to accompany the latest series of The F-Word. Here’s a collection that pulls together some superb recipes from ten of the world’s best cuisines, or nine of the world’s best cuisines and America, if you want to be picky. No cuisine is covered in real depth, but each is represented by a small clutch of first-rate and accessible recipes, things that may stretch the amateur cook, but none that would scare him or her off completely. This is where I always end up with Gordon Ramsay. I read his books and find myself inspired to cook his food. Flicking through World Kitchen time and time again, I pause on a Greek walnut cake, ‘drenched in a fragrant spice syrup’, a Thai green curry of beef, Chinese pork and prawn dumplings, a casserole of pheasant, a beautifully photographed Italian amaretto and chocolate torte, a proper fish pie. Plenty of ideas. Plenty of inspiration. Plenty of things I can do. As a collection, World Kitchen works fantastically well. There’s something here for most people. None of it is groundbreaking or completely new, but there’s a vibrancy and enthusiasm that’s infectious and exciting, a love of food and a mastery of craft that sets this book apart from the rest of the celebrity chef pack. Thanks to Quadrille for sending me a copy. You're right, it is more fun when it's other people doing the rude and lewd-ness. I can never pull off a full five-minute foul-mouthed rant without just looking like I need to be restrained and zip-tied. But yes, I think chefs who add "celebrity" to their title get the double-edged sword of sharing culinary knowledge with a wider audience, along with a tall glass of hatorade with all the naysayers. Life in the public eye is a tricky one. I can't wait until this new series of F word is on BBC America. That's my favorite of all of his shows. I much prefer the British airings of his shows to the American ones – Fox tends to over-hype Ramsay, turning him into an "evil" screaming individual, of which he is not. That's only one small snippet of his personality. I love his cooking, but I can understand the mumblings about him becoming so celebrity – that's how it seems to go when one is super-successful. Thanks for letting us know about this book! Might just have to order a copy!